· In a large bowl, over simmering water, melt the butter and chocolate until smooth. Add the coffee and stir until dissolved. Leave the mixture to cool to room temperature. · Preheat oven to 170C and line squared cake tin (20cmx20cm) with baking paper. · In a medium bowl mix sweetener, ground almond and baking powder. Add it all to chocolate mixture followed by eggs and vanilla extract. Beat until well blended. Add the nuts and mix all together. · Pour the batter into prepared cake tin and bake for about 20 minutes. The brownie should be still slightly wobbly in the middle. Be careful and don’t over bake it. Brownie doesn’t like it! Let it cool down before serving. I like it the most on next day. Source: I took it from diabetes.co.uk forum ages ago. Sorry but I can’t find the topic now. 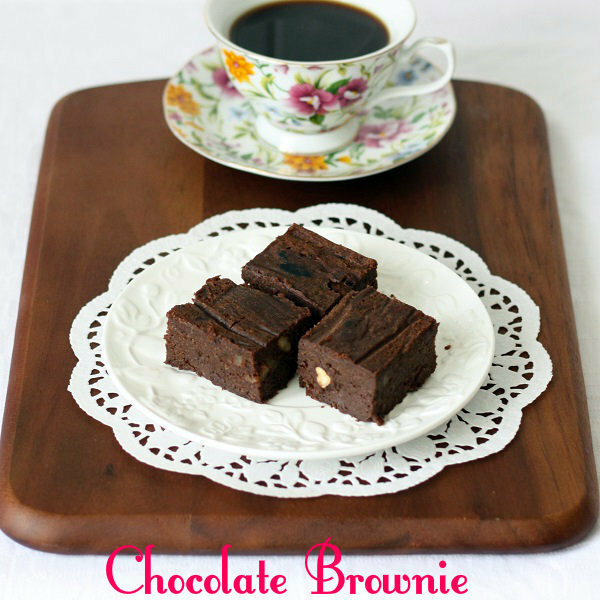 This doesn't look like a diet brownie at all :) (I mean this in a good way :) These look fantastic!! What a great recipe! Thanks Amy :) Ive had a look at your blog. Really nice recipes. I will try your avocado brownie soon. Quite interesting idea.. I don't like coffee, so use orange essence - it makes a lovely combination.